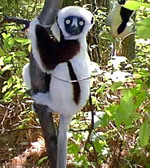 Coquerel's sifaka found on the northwest and west-central coasts of Madagascar. It was formely recognized as a subspecies of the Verreaux's sifaka (Propithecus verreauxi) but is now classed as an individual species. It is a medium-sized lemur with long hind legs and an upright posture. The average head and body length of adults is about 20 inches, and the average weight is around 11 lbs. The tail is also very long, reaching up to 24 inches. The coat is mostly white, with maroon patches on the chest and the front of the thighs and arms. The face is black and furless, except for a patch of white hair appearing on the muzzle. The bodies of Coquerel's sifakas are designed for tree-dwelling, and rather than swinging, they can leap between trees using their long, powerful back legs. They can propel themselves more than 30 feet in a single jump. When on the ground, they move in a very unusual but endearing way, as if performing a skipping dance on their hind legs, while holding out their arms for balance. Coquerel's sifakas prefer dry, deciduous forests near ponds and rivers for their habitat. Also, they prefer to live in family groups of three to ten, but some are known to live solitary lives. Diet consists of young leaves, flowers, fruit, bark and dead wood in the wet season, and mature leaves and buds in the dry season. They prefer to find most of their food in the trees, but will come down to the ground to search for food if need be. Mating occurs between January and March, and females will only mate with strong, dominant males. Consequently, males fight frequently, and some fights result in serious injury. 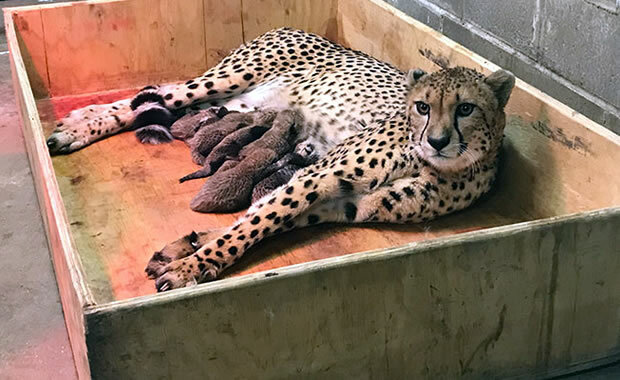 Females give birth to two to three young after an 89-day gestation period. Nests are built in tree holes or in dense foliage, and the young are nursed for about 1.5 months. This species is threatened due to its limited range. It has also suffered due to human destruction of forest for farmland development and logging and hunting. In some areas, hunting is now prohibited, and some groups can be found in two protected areas, the Ankarafantsika National Park and the Bora Special Reserve. This species has been successfully raised and bred in captivity. A large breeding colony can be found at the Duke Lemur Center in North Carolina. Other captive sifakas can be found in zoos. Copyright Notice: This article is licensed under the GNU Free Documentation License. It uses material from the Wikipedia article "Coquerel's sifaka". Glenn, C. R. 2006. "Earth's Endangered Creatures - Coquerel's Sifaka Facts" (Online). Accessed 4/23/2019 at http://earthsendangered.com/profile.asp?sp=980&ID=1. Need more Coquerel's Sifaka facts?